Venezuela makes it onto the big screen this May as Pixar's latest animated characters explore the mysterious tepui mountains of the Gran Sabana in the comedy movie "Up". The movie is billed as "a 3-D tale about a grumpy old man who ties balloons to his house and floats away with it to the South American jungle." Some insider sources have suggested that "Up" is a loose adaptation of Miguel de Cervantes classic novel "Don Quixote", but it's more like the Wizard of Oz. 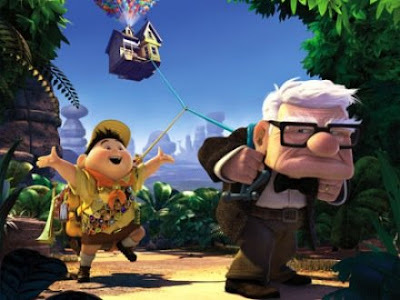 The story revolves around a curmudgeonly old balloon salesman called Carl Fredricksen (voiced by Ed Asner), a 78-year-old widower who promised his late wife Ellie that he would take her away to "Paradise Falls", the most beautiful and awe-inspiring waterfall in South America (based on Venezuela's Angel Falls). When developers threaten to move him into an old people's home, he decides to fulfill his promise to Ellie and embarks on a barmy plan to explore the globe in his own house. However, after tying 10,000 ballons to his home and sailing up into the sky he gets a nasty shock when he finds an 8-year-old Wilderness Ranger called Russell stowed away on his front porch. A report in Entertainment Weekly quotes co-director Pete Docter - who directed Monster Inc. - saying the Pixar team initially considered a desert island for Carl and Russell's destination but finally settled on Venezuela's majestic tabletop mountains after visiting the highest waterfall in the world Angel Falls and climbing a tepui called Mount Roraima. This area in the far south of Venezuela near the borders with Brazil and Guyana is known as "The Lost World" after a 1912 adventure novel of the same name by Arthur Conan Doyle - the creator of Sherlock Holmes - which tells the tale of a group of British explorers who climb a tepui only to find deadly dinosaurs and terrifying pterodactyls inhabiting its summit. Conan Doyle based his imaginary Lost World on descriptions of Mount Roraima by the first people to climb it, Everard Im Thurn and Harry I. Perkins, who were on an 1884 expedition to conquer the mountain sponsored by the Royal Geographical Society. Im Thurn described the summit of the flat-topped mountain as having "wildly extraordinary scenery" and "rocks and pinnacles of extraordinary shapes; seeming to defy every law of gravity!" Anybody who's ever been to the summit of Roraima will instantly understand Im Thurn's wonder at the ancient black rocks of the summit and the strange shapes they have been worn into by eons of erosion by the rain. The explorer marveled at "rocks ridiculous at every point with countless apparent caricatures of the faces and forms of men and animals, apparent caricatures of umbrellas, tortoises, churches, cannons and of innumerable other incongruous and unexpected objects." The Pixar team have done an incredible job of recreating the strange summit of Roraima in Up. To make sure they got the feel of such an otherwordly place, the director Pete Docter and 11 Pixar artists climbed Roraima in 2004. "We hiked up to the top of the mountain and stayed there for three nights, painting and sketching," Docter says, adding "it was great" and "everybody made it out alive." In another interview he described Venezuela's Lost World of tepui mountains as "a fantastic, weird place" with the "oldest rock on earth". Ronnie Del Carmen, a story artist who worked on the film, writes on his blog that visiting Roraima was "the grand daddy of all research trips. Easily the most adventurous, rigorous trip I've ever been involved in (and I've been in a few. They are a walk in the park by comparison)." According to del Carmen there was "danger at every turn: snakes, falling off cliffs, lethal bugs, spelunking under a crumbling cave ceiling... you know, fun." "Up!" will be the first Pixar film to be presented in Disney Digital 3-D. It is also the first animated feature to ever kick off the prestigious Cannes film festival - after it shared the limelight on 13 May with Quentin Tarantino's movie "Inglourious Basterds" and Terry Gilliam's "The Imaginarium of Dr Parnassus" - Heath Ledger's last movie. Pixar's Up will go on US release on 29 May and a video game based on the movie came out on 26 May. Indigenous Pemon myth: "The Great Flood and the Creation of Roraima"
From Disney*Pixar comes "Up", a comedy adventure about 78-year-old balloon salesman Carl Fredericksen, who finally fulfills his lifelong dream of a great adventure when he ties thousands of balloons to his house and flies away to the wilds of South America. 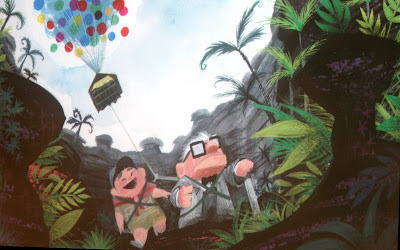 But he discovers all too late that his biggest nightmare has stowed away on the trip: an overly optimistic 8-year-old Wilderness Explorer named Russell. 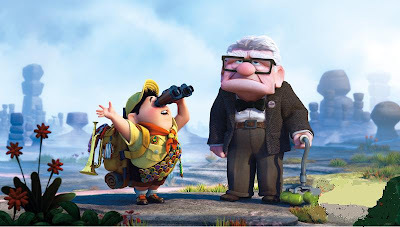 'Up' takes audiences on a thrilling journey where the unlikely pair encounter wild terrain, unexpected villains and jungle creatures. From the Academy Award-nominated director Pete Docter (Monsters, Inc.), Disney*Pixar's "Up" invites you on a hilarious journey into a lost world, with the least likely duo on Earth. Up will be presented in Disney Digital 3-D in select theatres. With all due respect, maybe those 2 were not the first people to climb mount roraima...I would suspect it was perhaps the indigenous inhabitants that first scaled it! I think Russell is right. All the evidence suggests that nobody had scaled the mountain before the 19th century expeditions. 1. The indigenous people in the area around the base told Koch Grunberg that the mountain was a bad place where evil spirits, or Mawariton, lived. 2. It took many attempts by westerners before a route was found to the top. Perkins and his expedition team had to cut their way though thick forest before they reached the plateau. 3. The Perkins route is the one used to day. Other routes that have been pioneered by mountain climbers are only possible with modern climbing techniques, use of ropes etc. 4. No evidence of indigenous cultures has been found on the tepui. Given these facts, I think it's pretty safe to say that the Perkins expedition was the first to reach the summit of Roraima. the best FILM i have ever seen! !